We have information you must know before you buy the Pilot. 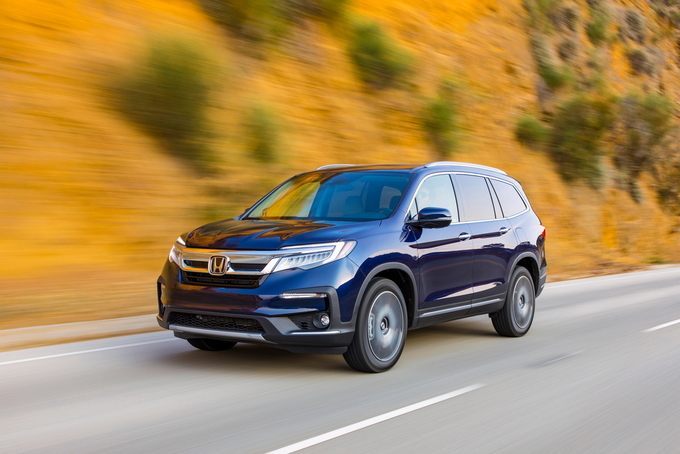 The 2019 Pilot is arriving at dealers with a revised grille, updated infotainment system, and standard Honda Sensing. If you like the Pilot but want something smaller, the 2019 Honda Passport may be up your alley. It's based on the Pilot's 111-inch platform but is 6 inches shorter from tail to nose with one less row of seats. As the latest model, deals are understandably scarce, making the Pilot the better value. The offers listed here are available nationally and expire April 30, 2019. Memorial Day is just over a month away, so keep an eye out for new deals to arrive. 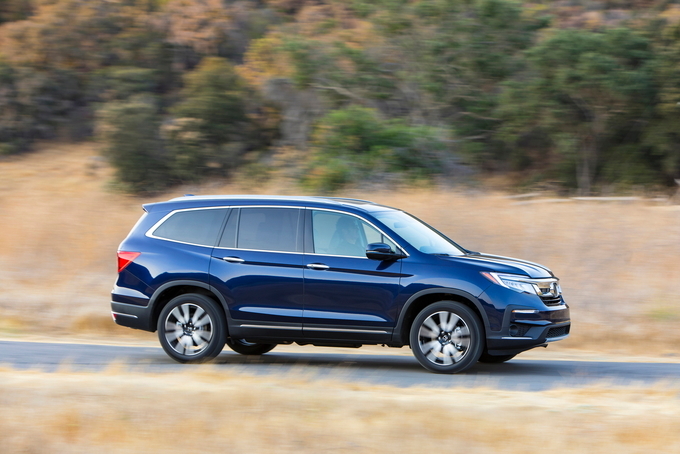 Honda continues to offer up to $1,000 in unadvertised cash incentives on the 2019 Pilot. Keep in mind, dealers do not have to pass this offer on to you and can even keep it as profit, so shop around for the best offers. What's more, qualified buyers can combine this offer with the low APR deal below. If you're planning to lease, you can get up to $600 in cash discounts on the 2019 Pilot. Honda also has $500 bonuses for recent college graduates and members of the military. Just know you must finance or lease through Honda Financial to get this deal. In January, Honda launched new APR deals on the 2019 Pilot. They start from 0.9 percent APR for up to 36 months and go up to 1.9 percent for 60 months. These remain the same in April. Qualified buyers can combine these APR deals with the unadvertised incentive above. The 2019 Honda Pilot's lease offers start from $299 per month for 36 months with $2,999 due at signing on the LX trim and top out at $389 per month with $3,299 due at signing for the EX-L trim with all-wheel drive. With effective monthly costs of $382 to $481, these are good deals relative to their MSRPs. Honda jumped into the three-row crossover utility vehicle segment early on, quickly establishing itself as a formidable player. That’s good news for consumers who can expect much in the way of quality, reliability, and advanced trappings from Honda. The 2019 Honda Pilot features several styling, powertrain and technology enhancements as it keeps pace with an ever-changing market. The 2019 Honda Pilot features a refresh on the current-generation design. New this year are updated front and rear fascias, including new headlights, bumpers, and taillights. Other updates include improved refinement for the nine-speed automatic transmission, a new display audio screen, 4G LTE WiFi, and Honda Sensing being standard on all trim levels. 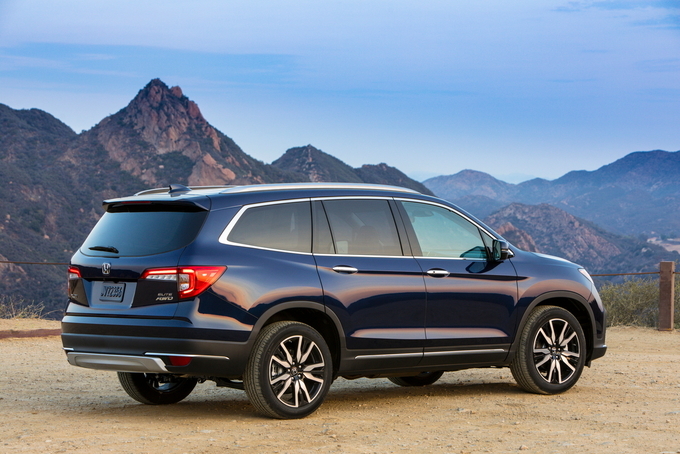 Honda offers one engine with the 2019 Pilot: a 3.5-liter V6 which makes 280 horsepower and 262 pound-feet of torque. Honda pairs this engine with a six-speed automatic transmission on the LX, EX, and EX-L trims. Both the Touring and Elite trims have a nine-speed automatic transmission. This transmission now starts in second gear for a smoother launch and for lower speed acceleration. When operating in snow mode, the transmission also starts in second gear for better grip. All trims except the top-of-the-line Elite come with standard front-wheel drive, but all-wheel drive is available on all other trims for $1,900. The 2019 Pilot earns an EPA-estimated 19 miles per gallon in the city, 27 mpg on the highway, and 22 combined with FWD and the six-speed transmission, while AWD drops ratings by one mpg in each category. The Pilot with the nine-speed transmission gets 20/27/23 mpg (city/highway/combined) with FWD and 19/26/22 mpg with AWD. The Honda Pilot has a maximum towing capacity of 5,000 pounds. Honda offers the 2019 Pilot in five trims: LX, EX, EX-L, Touring, and Elite. The list of standard features includes LED low-beam headlights, automatic high beams, 18-inch alloy wheels, a six-speaker audio system with a five-inch display, heated door mirrors, and Honda Sensing. Honda Sensing represents a suite of driver-assist features, including lane keeping assist, lane departure warning, road departure mitigation, forward collision warning, automatic emergency braking, and adaptive cruise control. The base Pilot LX model starts at $32,445 (all prices include the $995 destination charge). Standard equipment includes low-beam LED headlights, LED daytime running lights, automatic headlights, and the Honda Sensing System. Honda also includes 18-inch alloy wheels, heated side mirrors, cloth seats, and a six-speaker audio system. Other features include a multi-angle rearview camera with static guidelines. There are no packages available on the LX, so choices are limited to color, wheel upgrades, and accessories. The Pilot EX costs $35,325. This year, several new features arrive to the trim level, bringing more value to the Pilot’s second model. These features include side mirrors with turn signal indicators, one-touch power windows, an eight-way power driver’s seat, heated front seats, one-touch second-row seats, HD Radio, a blind-spot monitoring system, and rear cross-traffic alert. The EX also comes with remote engine start, keyless entry, LED fog lights, heated outside mirrors, illuminated visors, satellite radio, and smartphone connectivity with Android Auto and Apple CarPlay. Honda prices the middle EX-L trim from $38,755. 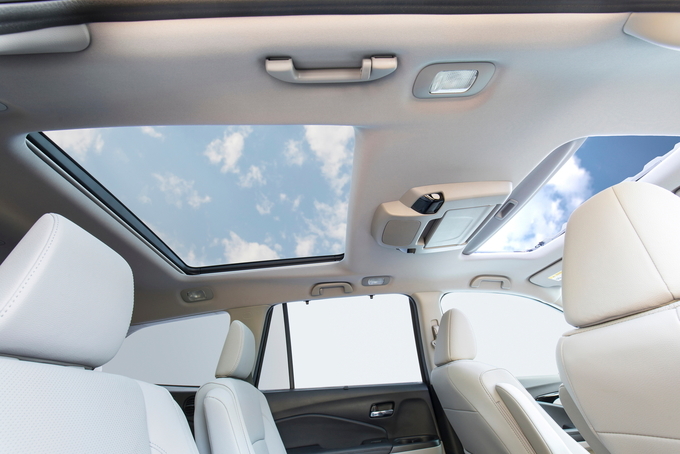 Among the new features with this model are HomeLink, second-row sunshades, a power tailgate, a moonroof, and driver seat and mirror memory. Also included is an automatic dimming rearview mirror, a leather-wrapped steering wheel, leather-trimmed seats, a power passenger seat, and two USB ports for the second row. The Advanced Navi and RES Package ($1,600) adds navigation and a rear entertainment system. The Pilot Touring begins at $43,515 and brings in the nine-speed automatic transmission with automatic start and stop. Other new features include a hands-free power tailgate, ambient lighting across all three rows, and Honda’s cloud-based services. Also standard are 20-inch wheels, parking sensors, high- and low-beam LED headlights, paddle shifters, a 10-speaker audio system, an AC outlet, a roof rack, and exterior trim garnishment. The navigation and rear seat entertainment system are standard, and second row captain's chairs are available for $300, though it reduces passenger capacity from eight to seven. The Pilot’s Elite trim pulls out all the stops, and you'll pay for it, too, with its starting price of $49,015. Fortunately, the crossover comes loaded, so there's no need for a package with this trim. New this year are power-folding and automatic-dimming side mirrors and a wireless phone charger. You’ll also find a panoramic moonroof, ventilated front seats, ambient lighting, rain-sensing wipers, a heated steering wheel, navigation, the rear seat entertainment system, and the second-row captain’s chairs. 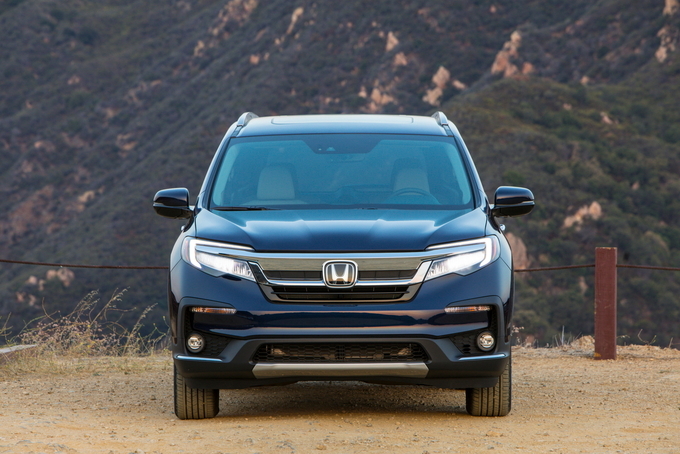 We applaud Honda for making its stellar Honda Sensing system standard across the 2019 Honda Pilot lineup. It not only makes driver-assist features available throughout, it also means families don’t have to choose among options to get what they want. That said, we think the EX-L delivers a comprehensive package, although we do recommend the Advanced Navi and RES Package if you have young children. Otherwise, forego this package and use the smartphone connectivity tools to help take you where you’re going. When you think of a family SUV, odds are good that you’re thinking of the Honda Pilot. It’s a regular on suburban streets thanks to the right mix of space, comfort, and top-notch safety. The 2019 Honda Pilot sees a few well-placed upgrades, notably in the styling and technology departments. It remains a well-deserved favorite among mid-size SUVs. The base LX trim might be the cheapest way to get a Pilot, but it’s worth upgrading to the EX. Since all Pilots house the same 3.5-liter V6 engine, your money goes toward extra creature comforts like heated seats, three-zone automatic climate control, an eight-inch infotainment screen, and blind-spot monitoring. Honda’s continuing mission to make the world safer means that all new Pilots see an upgraded suite of Honda Sensing technology, including automatic emergency braking, lane keeping assist, and adaptive cruise control. The upper-level trims add more features like premium audio and a mobile hotspot, but they come with a jerky nine-speed automatic transmission. The EX has plenty of luxury for our tastes anyway, and even with all-wheel drive, our build stays well south of $40,000. In most forms, the Honda Pilot is remarkably capable. The V6 engine offers strong acceleration without feeling rough. The ride is supremely comfortable, even with the optional 20-inch rims. The Pilot is no sports car, but quick and responsive steering makes it confident in the curves. It’s reasonably confident off road as well, with good ground clearance and a versatile all-wheel-drive system. With AWD, it can even tow up to 5,000 pounds. The only major chink in the Pilot’s armor is the optional nine-speed transmission. Although the extra cogs sound great on paper, in practice the box gets confused when searching for the right ratio. This transmission also received some updates for 2019, and while it’s better at low speeds, it still doesn’t warrant the premium price tag. The other compromise of the powerful V6 is fuel economy – the Pilot manages only a mediocre 19 miles per gallon city, 27 mpg highway, and 22 combined with front-wheel drive and the six-speed transmission. The 2019 Pilot sees a few styling tweaks that help keep things modern. A revised grille up front is balanced by updated taillights at the rear, both decorated with more extensive chrome. It’s an elegant and boxy look, which manages to remain interesting without taking many big risks. Unpainted black plastic around the wheel wells lends a touch of ruggedness, although the Pilot still looks more suited to the mall than the mountains. The cabin is spacious and well designed, with plenty of nooks and cubbies for storage. 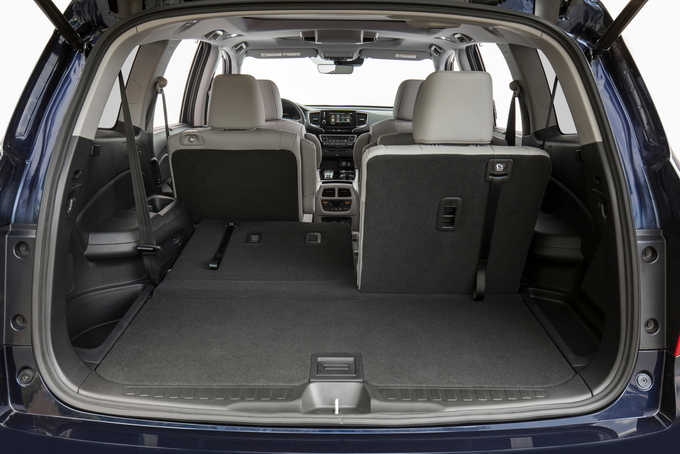 The third row is among the most comfortable in this class, and cargo space can expand up to nearly 84 cubic feet. The Pilot still looks suspiciously close to a minivan, which may be a turnoff to some buyers. And while pleasant, the interior is a bit dull. The base trim uses a five-inch infotainment screen that feels cheap, as do some of the interior materials. Especially on the higher trims, we would have liked a more premium feel. We would have been happy enough with the engine and ride, but Honda’s practical and spacious cabin completes the package. If they could fix the nine-speed transmission, we would have little to complain about, although we would love to see a hybrid or efficiency model in the future. For suburban families, the Pilot just makes plain sense. 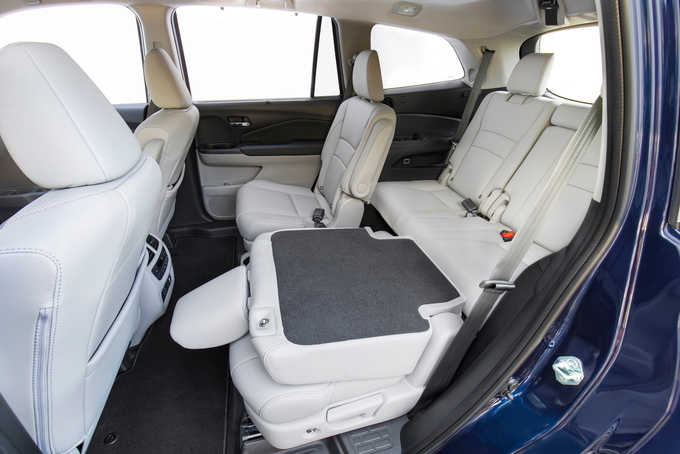 The cabin is comfortable and tech-friendly to keep the parents happy, while Honda’s excellent safety record lends peace of mind. Spacious three-row seating is perfect for ferrying many small passengers, and the powertrain can handle just about anything. Buyers who want a dedicated people-carrier may still prefer a minivan, and the truly adventurous will need more off-road capability. The Pilot is an excellent all-around vehicle, but it still can’t match the spatial practicality of minivans or the ruggedness of more specialized SUVs. The 2019 Honda Pilot checks all the boxes for family life. Voluminous cargo capacity and cabin storage? Check. Comfy three-row seating? Check. Adventure-capable? Check. Comprehensive standard safety tech? Check. It’s not without minor flaws, but for an all-around mid-size SUV, the Pilot still offers the works at excellent value. We have partnered with trusted dealers in your area to give you a great price on the new Honda Pilot.